For personalized commute planning and Metrolink information, call the Customer Service Center at 800/371-LINK(5465). Recorded Metrolink schedules are available 24 hours a day and operators are available Monday through Friday from 6:00 am to 8:00 pm and Saturday 8:00 am to 5:00 pm. 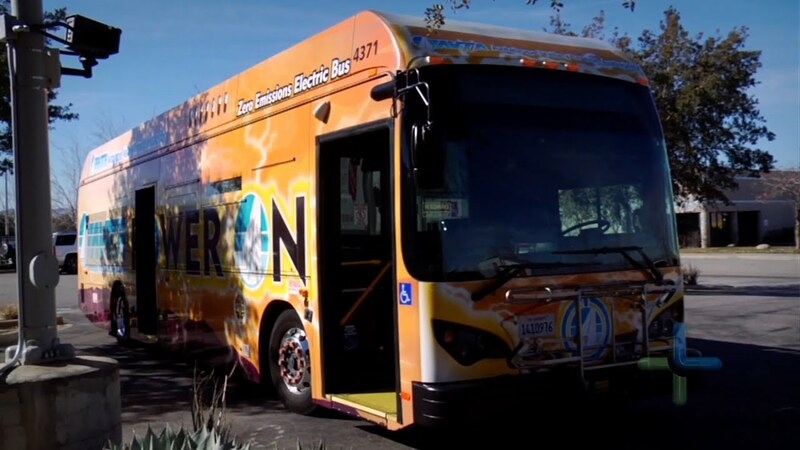 The Antelope Valley Transit Authority’s (AVTA) goal of a full conversion to an all-electric bus fleet, with the plan to be “100% Green in 2018” is closer than ever. The first two of a potential 13 state-of-the-art wireless inductive charging stations are operational at Deputy Steve Owen Memorial Park (OMP) and Palmdale Transportation Center, the two major transfer centers in the AVTA service area. The en-route chargers allow AVTA’s electric buses to charge during layovers as passenger’s board and disembark. This “top-off” charge capability significantly extends the range of AVTA’s electric bus fleet, completely eliminating any range anxiety associated with electric buses. AVTA currently operates two electric buses and 73 diesel buses on 13 local routes, four commuter routes and one route that operates during commute times. The agency provides local, commuter, and dial-a-ride service to a population of more than 450,000 residents in the cities of Lancaster and Palmdale as well as the unincorporated portions of northern Los Angeles County. Its total service area covers 1,200 square miles and it is bounded by the Kern County line to the north, the San Bernardino County line to the east, the Angeles National Forest to the south, and Interstate 5 to the West. Since service began, the North County TRANSporter has become a vital link for hundreds of resident providing freedom to travel throughout Los Angeles and beyond. As Southern California’s premier regional rail system, we do everything in our power to provide high-quality, dependable, on-time service. This commitment to excellence is a promise our riders have the right to expect. Routes from the antelope Valley are available 7-days a week. Check the schedule for details. By 2029, the system will run from San Francisco to the Los Angeles basin in under three hours at speeds capable of over 200 miles per hour. The system will eventually extend to Sacramento and San Diego, totaling 800 miles with up to 24 stations. Included in the project is a statewide rail modernization plan for existing infrastructure. “It is part of our vision as an intermodal transportation hub unlike any place in the world, with two high speed rail systems, an airport, the High Desert corridor, Antelope Valley Freeway, Metrolink, Amtrak, and AVTA all converging in Palmdale.” Palmdale Mayor Jim Ledford, Jr.
Connects the Central Valley to the Antelope Valley, closing the existing passenger rail gap over the Tehachapi Mountains. Route Details: 80-mile route (approximately) from Bakersfield to Palmdale. Connects the Antelope Valley to the San Fernando Valley in order to bring high-speed rail service to the urban Los Angeles area. Route Details: 40-mile route (approximately) from Palmdale to Burbank. The High Desert Corridor (HDC) project is considering construction of a new multi-modal link between State Route (SR)-14 in Los Angeles County and SR-18 in San Bernardino County. Metro and Caltrans successfully completed the High Desert Multipurpose Corridor (HDMC) Environmental Impact Statement/Environmental Impact Report (EIS/EIR) in June 2016. Metro and the partner agencies are now seeking funding and implementation strategies that would support continuation of the project through design and construction.